Researchers at the University of Rochester have measured for the first time light emitted by photoluminescence from a nanodiamond levitating in free space. In a paper published this week in Optics Letters, they describe how they used a laser to trap nanodiamonds in space, and � using another laser � caused the diamonds to emit light at given frequencies. 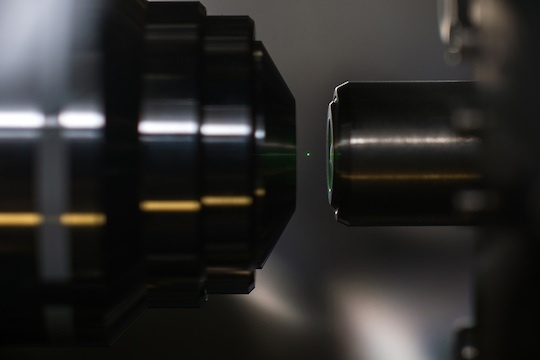 The experiment, led by Nick Vamivakas, an assistant professor of optics, demonstrates that it is possible to levitate diamonds as small as 100 nanometers (approximately one-thousandth the diameter of a human hair) in free space, by using a technique known as laser trapping. "Now that we have shown we can levitate nanodiamonds and measure photoluminescence from defects inside the diamonds, we can start considering systems that could have applications in the field of quantum information and computing," said Vamivakas. He said an example of such a system would be an optomechanical resonator. Vamivakas explained that optomechanical resonators are structures in which the vibrations of the system, in this case the trapped nanodiamond, can be controlled by light. "We are yet to explore this, but in theory we could encode information in the vibrations of the diamonds and extract it using the light they emit." Possible avenues of interest in the long-term with these nano-optomechanical resonators include the creation of what are known as Schr�dinger Cat states (macroscopic, or large-scale, systems that are in two quantum states at once). These resonators could also be used as extremely sensitive sensors of forces � for example, to measure tiny displacements in the positions of metal plates or mirrors in configurations used in microchips and understand friction better on the nanoscale. "Levitating particles such as these could have advantages over other optomechanical oscillators that exist, as they are not attached to any large structures," Vamivakas explained. "This would mean they are easier to keep cool and it is expected that fragile quantum coherence, essential for these systems to work, will last sufficiently long for experiments to be performed." The future experiments that Vamivakas and his team are planning build on previous work by Lukas Novotny, a co-author of the paper formerly at Rochester and now at ETH in Zurich, Switzerland, and Romain Quidant, also a co-author from ICFO, Spain. Novotny, Quidant and their teams showed previously that by tweaking the trapping laser's properties, a particle can be pushed towards its quantum ground state. By linking the laser cooling of the crystal resonator with the spin of the internal defect it should be possible to monitor the changes in spin configuration of the internal defect � these changes are called Bohr spin quantum jumps � via the mechanical resonator's vibrations. Vamivakas explained that experiments like this would expand what we know about the classical-quantum boundary and address fundamental physics questions. The light emitted by the nanodiamonds is due to photoluminescence. The defects inside the nanodiamonds absorb photons from the second laser � not the one that is trapping the diamonds � which excites the system and changes the spin. The system then relaxes and other photons are emitted. This process is also known as optical pumping. The defects come about because of nitrogen vacancies, which occur when one or more of the carbon atoms in diamond is replaced by a nitrogen atom. The chemical structure is such that at the nitrogen site it is possible to excite electrons, using a laser, between different available energy levels. Previous experiments have shown that these nitrogen vacancy centers in diamonds are good, stable sources of single photons, which is why the researchers were keen to levitate these particles. Using lasers to trap ions, atoms and more recently larger particles is a well-established field of physics. Nanodiamonds, however, had never been levitated. To position these 100 nanometers diamonds in the correct spot an aerosol containing dissolved nanodiamonds sprays into a chamber about 10 inches in diameter, where the laser's focus point is located. The diamonds are attracted to this focus point and when they drift into this spot they are trapped by the laser. Graduate student Levi Neukirch explains that sometimes "it takes a couple of squirts and in a few minutes we have a trapped nanodiamond; other times I can be here for half an hour before any diamond gets caught. Once a diamond wanders into the trap we can hold it for hours." The Rochester researchers collaborated on this paper with Lukas Novotny, formerly at the University of Rochester and now at ETH Zurich, Switzerland, and with Jan Gieseler and Romain Quidant, at ICFO in Barcelona, Spain. The researchers acknowledge the support from the University of Rochester, the European Community's Seventh Framework Program, Fundaci� privada CELLEX and from the U.S. Department of Energy.